The 12 - 24mm is a classic Sigma ultra-wide angle zoom lens that is great for producing an exaggerated perspective to really add impact to your pictures. With a fine heritage dating back more than 30 years, this compact lightweight design makes it an ideal companion for travelling as well as a great tool for your architectural, landscape, and creative shots. 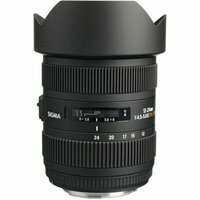 Sigma's unique Super Multi-Layer Coating on the lens elements reduces flare and ghosting that can ruin your shots and the high-speed autofocus system (HSM) ensures quiet and high-speed autofocus. As you would expect from this reputable manufacturer, this zoom has superior peripheral brightness and provides sharp and high contrast images even at the maximum apertures. The Photographer magazine said that they had never seen anything like it in their lives with that common feature of ultra wide lenses, curvature at edges being virtually non-existent and Amateur Photographer agreed, commenting that the lens had been corrected to exceptional standards.